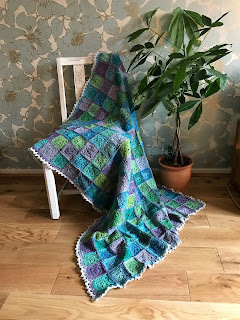 So, as promised, today I'm going to share the instructions to make my Water Lilies blanket. 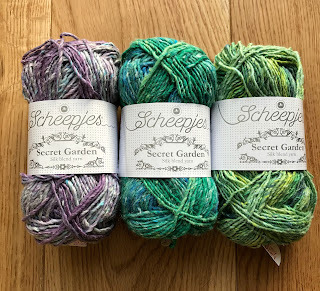 If you can remember all the way back to this post, I fell in love with Scheepjes Secret Garden yarn. I settled on 3 main colours for my blanket. From left to right: 709 Lily Pond, 703 Secluded Lake and 702 Herb Garden. And the name of the blanket was found! 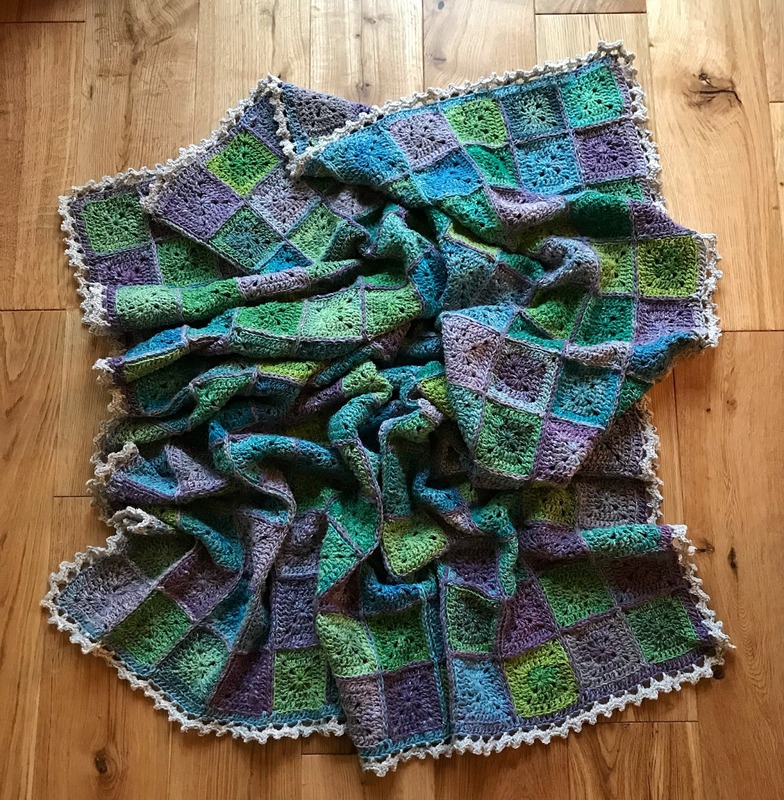 The blanket is an easy make. Suitable for beginners and the more experienced hookers alike. For the latter, it's a good TV project! Any enough chatter...let's get on with it! Using a 4mm hook chain 4 and join with a slip stitch. You will need to make 221 square in total. I used 6 balls of both Secluded Lake and Herb Garden but only 5 of Lily Pond. 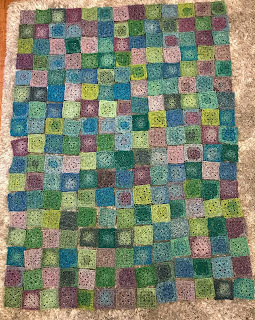 Block to 3 inch square. 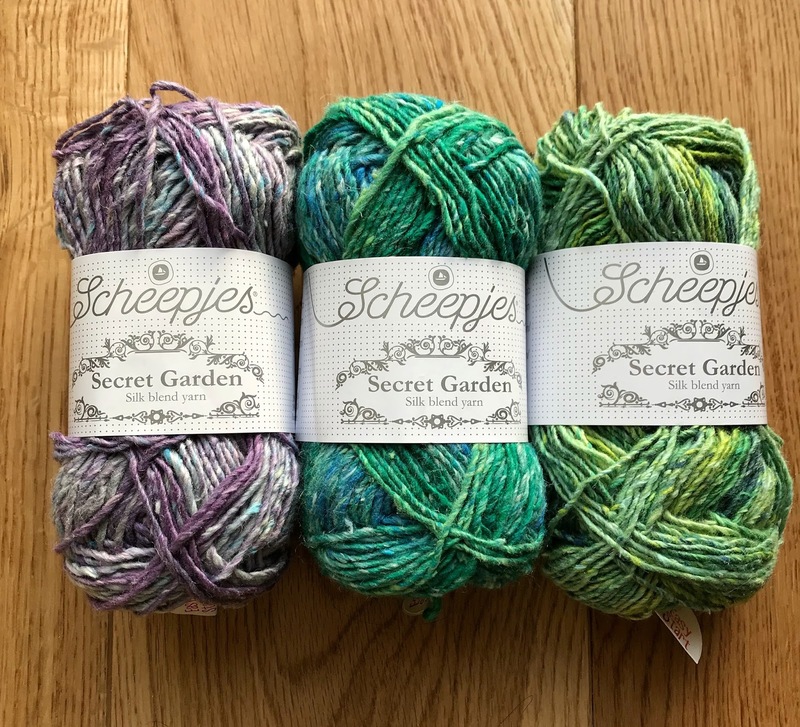 Due to the nature of the yarn, there are variations in thickness. When you get to thinner bits work a little looser and vice versa. You may have to stretch some of the squares more than others. Don't panic! It'll all come good in the end! Ok, now you have made all of your squares it's time to join them together. I have 13 squares across and 17 squares down. 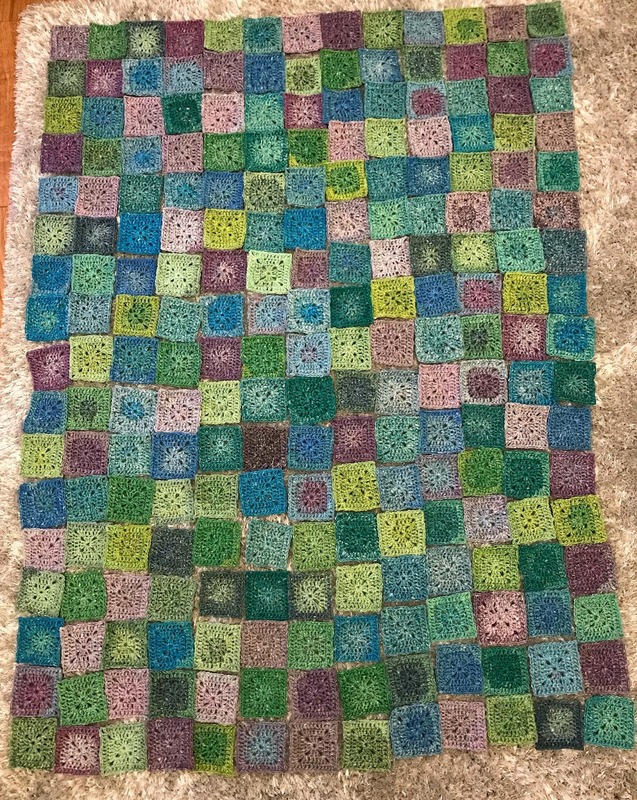 I laid the squares out to check that I was happy with the colour placement (I'm a Virgo.....I don't really do random!!!) I then took a quick snap with my phone for reference and then carefully made 17 piles of 13 squares ready to be joined. I also placed them in order. Obviously you can take a more relaxed and random approach! 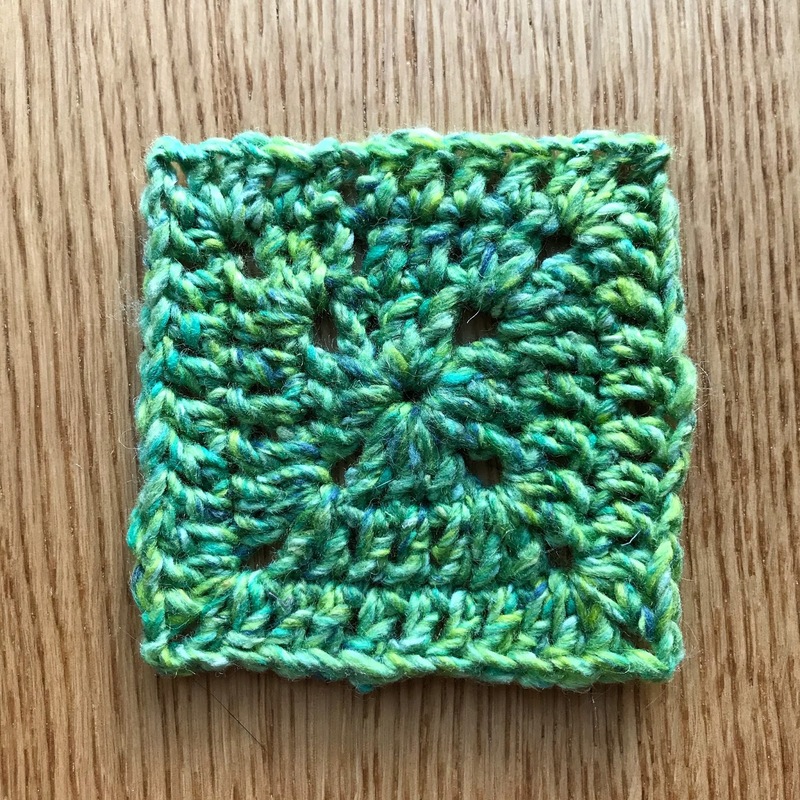 Join with Lily Pond colour way using a 5mm hook. I have chosen a larger hook to join with as I'm using a zipper joining method. The larger hook size gives you a bit of give in the join. I have joined my blanket in exactly the same method. So now your squares are all joined we can now move onto the border. Round 1. Using a 4mm hook and Lily Pond join the yarn into any BACK LOOP of the edge. Chain 3 (counts as first treble) and then work treble crochets into the back loops of stitches all the way round the blanket. The corners are made the same as before (2tr, ch2, 2tr) into the corner chain spaces. Once you have worked all the way round join as before and fasten off. Round 2. Using Bird Bath join in the first stitch of an edge. 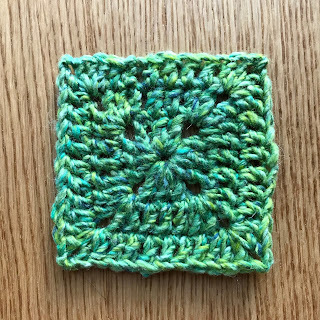 Ch1, double crochet in same stitch. *Chain 3, skip 2 stitches, double crochet in next stitch. Repeat from * to corner. (You may have to fudge this a little to ensure you finish at the corner with a dc, don't worry! It will look ok once we have worked the next round) Chain 3 at corner and double crochet in the first stitch of the next edge. 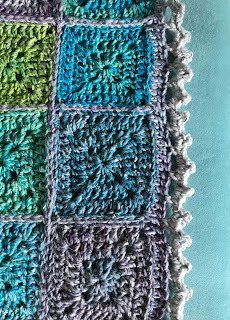 Continue around the blanket and join with a slip stitch into the first double crochet. Round 3. Chain 1 and double crochet in the same stitch. work *(2dc, ch3, 2dc) into the 3-ch space, double crochet in next stitch. 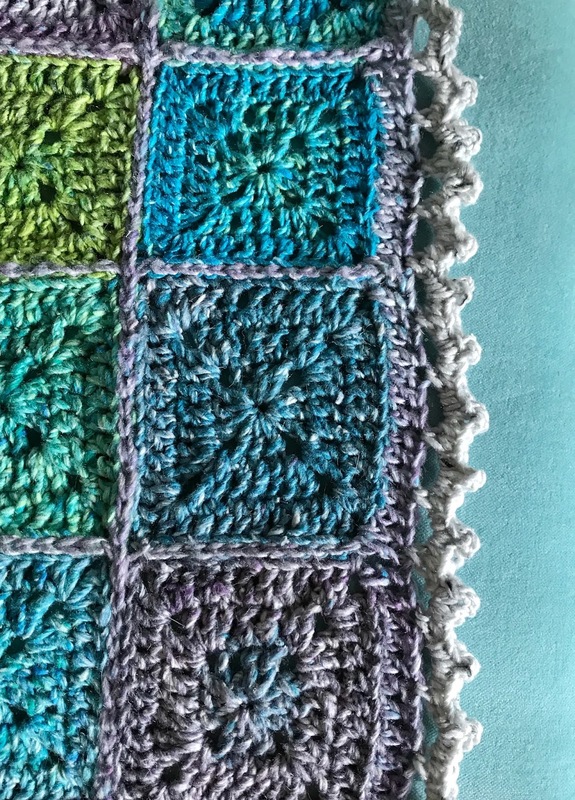 Repeat from * all the way around the blanket (omitting the final dc at the end) and join with a slip stitch to the first dc. Now you can block your border. I'll leave you with another photo of the finished blanket. I do hope you can understand my instructions! Ohhh Maria it’s gorgeous. I bet it feels amazing too.